Hello, and welcome back to our third blog article! Last time, we looked at the process of buying a tablet and focused on motives for purchasing one. It’s understood that decisions which lead to making particular choices are based on personal preferences like brand, intended use, design appeal, price, operating system, etc. However, many of us fail to look at the user experience with the physical tablet. Most of us know in advance how we intend to use our tablet from the stand point of application. But where will we be while using it? Are we reclined in a bed or sitting in a chair? Standing or on the move? What time of day will it be used most? Is it for education, the arts, entertainment, business, leisure life? Will it always be a personal device, or shared in an interactive person-to-person environment? It could be for some or all of those situations, and more. If you are someone who desires to get a lot of use out of your tablet, you will find yourself cycling through scenarios in this list over and over again. And let’s face it, tablet design as currently exhibited, does not demonstrate a focus on ergonomics. Maintaining a healthy posture and holding the tablet properly to reduce fatigue to the body or prevent damage to the device, or adjusting the screen to a stable, optimal viewing angle can often be a challenge. It’s nearly impossible to use a tablet with a single hand all the time. The very nature of how humans interact with the device and its accessories demands two-handed attention in order to stay comfortable or efficiently arrange it into position. Occurrences like text neck, hand, wrist, arm or shoulder pain can also come into play. What if you don’t have a free hand to use or are preoccupied with multi-tasking? There are countless accessories that can accommodate the user with solutions for many of these individual needs, and that may bring an on-going expense to the tablet user especially when it’s time to upgrade to a new tablet. This is because most accessories are not setup to address multiple needs. Only one of them works with the majority of all tablets on the market past or present. 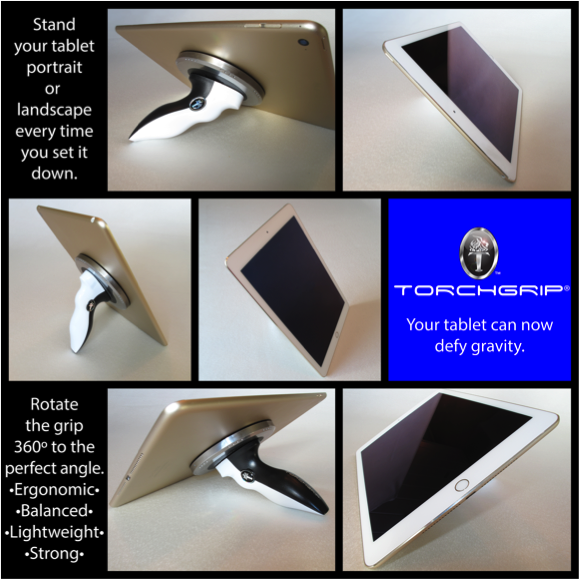 That one tablet accessory solution is TORCHGRIP®. 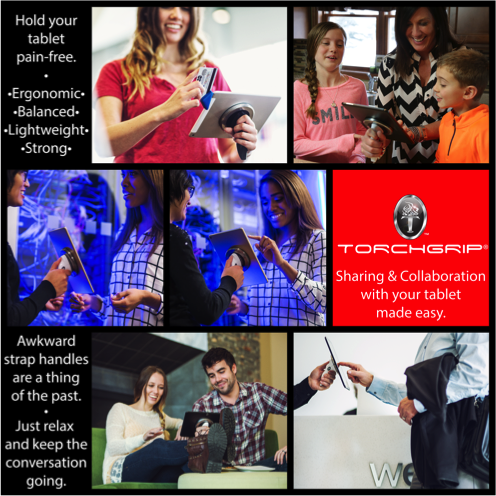 It will enhance the way you and your associates stand, hold, share and use your tablet. You can see it and learn more by visiting www.torchgrip.com, Facebook, Instagram & YouTube.